What could possible be better than having an iPhone or iPod touch with five docked icons at the bottom of screen? Yes, you guessed it, having ten docked icons is undoubtedly better and provides double the docked app fun. The DoubleDock tweak that hit the Cydia store in the last few hours offers that exact functionality, and will definitely prove to be one of those packages that either appeals or it doesn’t. 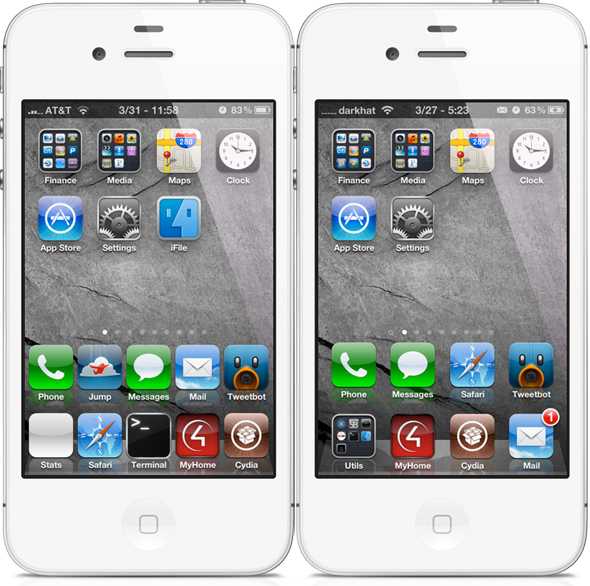 The standard iPhone screen setup allows for four rows of icons as well as a docked portion of the screen that allows a number of applications to be permanently housed for quick and easy access. By default, Apple allow four icons in the dock but there are various Cydia packages available that allow that number to be extended at the users will. The new DoubleDock tweak essentially creates a secondary docked area above the existing one, meaning that an additional set of icons can be placed for fast access. Developer Evan Lucas has pushed this tweak out for those who may have more than five favorite applications, and I am pretty sure that a large number of users will appreciate the simplicity of the tweak and not having to scroll through various home screens to find the apps they want. The flip side of that argument is the fact that the second dock inevitably has to take up real estate on the display and therefore removes the ability to have four rows of icons. DoubleDock doesn’t offer any additional settings and is extremely easy to use due to its native nature. Simply put the icons into editing mode and place the icons in the secondary dock as normal. The current version 1.0-23 has incompatibility issues with the popular Infinidock and Five Icon Dock tweaks which is something you should be aware of before purchasing DoubleDock. Those two tweaks are flagged as incompatible, meaning that Cydia will auto uninstall them when installing DoubleDock. DoubleDock is available from the Big Boss repository for $0.99.